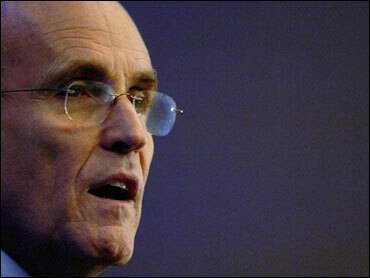 Republican presidential hopeful Rudy Giuliani on Wednesday won the endorsement of Texas Gov. Rick Perry, despite their differences on abortion rights. The announcement came at a meeting of the anti-tax Club for Growth, during which Giuliani also made a policy shift designed to reassure fiscal conservatives that he would not raise taxes to help short up Social Security. Perry, an abortion opponent, said his biggest concern had been Giuliani's support for abortion rights but that he was satisfied Giuliani would appoint judges who view the issue conservatively. "The one (issue) that I wanted to hear him give me an answer and look me right in my eyes was that issue of who can I expect, what type of individual can I expect on the Supreme Court," Perry said at a news conference with Giuliani. "He clearly said ... you can look for people like Scalia and Roberts and Alito. Let me tell you, I can live with that," Perry said, referring to conservative Supreme Court Justices Antonin Scalia and Samuel Alito and Chief Justice John Roberts. Perry said when he buys a pickup truck, he doesn't rule it out simply because it has one option he doesn't like. Giuliani, who is addressing social conservative voters this weekend in Washington, said he wants conservatives to focus on areas where he agrees with them. "I'm not going to get every vote," he said. "The idea is going to be that there's enough we agree about and enough we're facing - foreign threats and domestic problems - that it may just be if they think about it, that I'm the best candidate." "What I really want is a relationship in which we respect each other, even if we disagree," Giuliani said. Discussing Social Security, Giuliani said he had ruled out a tax increase to help keep the program solvent, an option he had previously suggested was still on the table. The former New York mayor also said the best remedy for the current housing slump would be for Congress to make President Bush's tax cuts permanent, adding that would "do much much more for the economy than a tailored bailout." Giuliani said that as mayor of New York, he had cut spending by more than "any contemporary of mine in the 1990s" in government, a category that presumably included former Massachusetts Gov. Mitt Romney, a presidential rival. Giuliani leads his Republican rivals in national opinion polls, and was one of three contenders on the agenda for the Club for Growth meeting. Former Sen. Fred Thompson and Romney were the others - the former governor by remote hookup. Like other contenders for the White House, Giuliani has yet to outline a detailed proposal for overhauling Social Security, the giant government retirement system that faces a financial crisis as the Baby Boom generation ages and begins to draw benefits. In an interview last month with The Associated Press, Giuliani refused to rule out raising taxes to help shore up Social Security. He said at the time he would assemble a bipartisan group to develop proposals. "I am opposed to tax increases, but I would look at whatever proposal they came up with and try to figure out how we can come up with a bipartisan way to do it," he said at the time. Asked by Club for Growth President Pat Toomey at the morning meeting to discuss Social Security, Giuliani quickly responded, "I would rule out a tax increase for that purpose or any purpose."